Glomerular diseases are common and important. They can arise from systemic inflammatory or metabolic diseases that affect the kidney. Alternately, they are caused primarily by local glomerular abnormalities, including genetic diseases. Both intrinsic glomerular cells and leukocytes are critical to the healthy glomerulus and to glomerular dysregulation in disease. Mesangial cells, endothelial cells, podocytes, and parietal epithelial cells within the glomerulus all play unique and specialized roles. Although a specific disease often primarily affects a particular cell type, the close proximity, and interdependent functions and interactions between cells mean that even diseases affecting one cell type usually indirectly influence others. In addition to those cells intrinsic to the glomerulus, leukocytes patrol the glomerulus in health and mediate injury in disease. Distinct leukocyte types and subsets are present, with some being involved in different ways in an individual glomerular disease. Cells of the innate and adaptive immune systems are important, directing systemic immune and inflammatory responses, locally mediating injury, and potentially dampening inflammation and facilitating repair. The advent of new genetic and molecular techniques, and new disease models means that we better understand both the basic biology of the glomerulus and the pathogenesis of glomerular disease. This understanding should lead to better diagnostic techniques, biomarkers, and predictors of prognosis, disease severity, and relapse. With this knowledge comes the promise of better therapies in the future, directed toward halting pathways of injury and fibrosis, or interrupting the underlying pathophysiology of the individual diseases that lead to significant and progressive glomerular disease. The glomerulus is a spherical mass of specialized capillaries fed by an afferent arteriole and draining into an efferent arteriole. 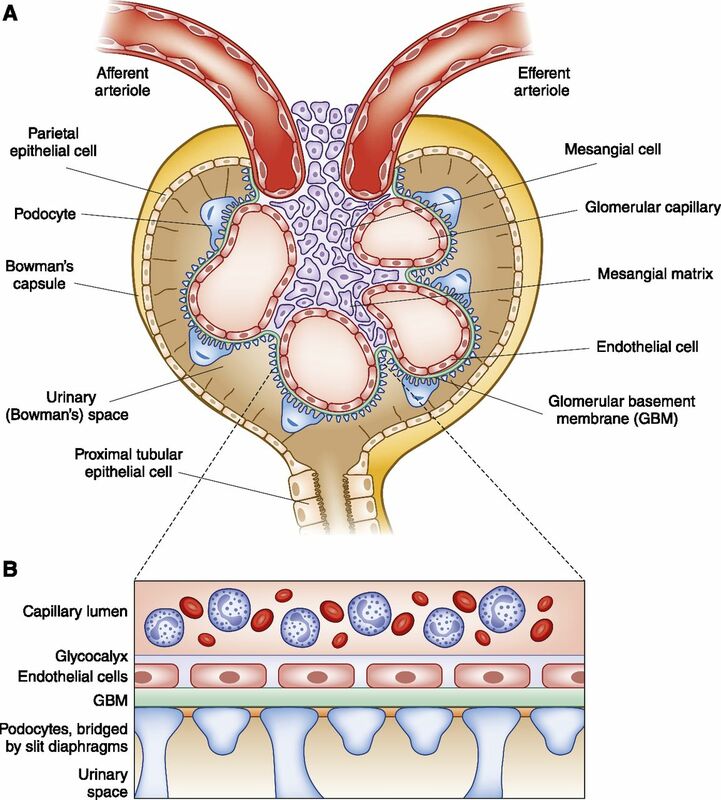 The urinary space (Bowman’s space) is surrounded by Bowman’s capsule, a basement membrane to which a layer of glomerular parietal epithelial cells (PECs) adheres (Figure 1A) (1). Mesangial cells and mesangial matrix form the central, tuft-like structure on which the glomerular microvasculature lies (1). The glomerular filtration barrier (GFB), specialized to permit substantial filtration of water and solutes, is composed of three layers: glomerular endothelial cells (with glycocalyx), the glomerular basement membrane (GBM), and podocytes, within Bowman’s space (Figure 1B). Studies in white adult males without known kidney disease have shown a median of 940,000 nephrons per individual and a glomerular volume of 2.4×106 μm3, with glomeruli possessing a median of 558 podocytes, 367 PECs, and 1383 nonpodocyte cells within the glomerular tuft (2). Basic structure of the glomerulus and the glomerular filtration barrier. (A) Each glomerulus is composed of an afferent arteriole, which supplies the glomerular capillaries, and an efferent arteriole, into which they drain. Mesangial cells and mesangial matrix provide structural support for the glomerular capillaries, lined by specialized fenestrated endothelium, and then the glomerular basement membrane. On the urinary side of the glomerular basement membrane are podocytes, with foot processes that wrap around the glomerular capillaries. The urinary space is lined by a cup-like layer of parietal epithelial cells which adhere to the basement membrane of Bowman’s capsule. (B) The glomerular filtration barrier is a specialized molecular sieve, with properties that aid filtration of small solutes from the blood to the urine, while limiting the passage of macromolecules such as albumin. Glomerular cells are critical to normal physiology but are targets of a range of injurious processes in disease, including immune, metabolic, vascular, and malignant disorders. While the clinical manifestations of glomerular disease are variable in severity, they are relatively limited in nature. Histologically, in “proliferative” disease, intrinsic glomerular cells proliferate and leukocytes accumulate. Cell death leads to histologically visible areas of necrosis or cell loss with reactive segmental scarring. Immune deposits (Ig, complement, or other material) can accumulate. Additional glomerular extracellular matrix (ECM) can accumulate, and with severe or prolonged disease, glomeruli sclerose. Until relatively recently, syndromic combinations of clinical and histologic features have been the bedrock of the nomenclature of glomerular disease. However, advances in our understanding of glomerular biology and disease pathogenesis suggest that we need to progress beyond standard histopathology to describe and classify glomerular disease in the most meaningful manner. Within glomeruli, podocytes, mesangial cells, and endothelial cells engage in multidirectional cross talk among themselves and with leukocytes (3). For example, podocyte injury may induce mesangial cell proliferation, and mesangial cell injury can lead to podocyte foot process effacement and fusion. Signals from mesangial and endothelial cells are necessary for normal podocyte function (4). In some cases, cell-specific, conditional knockout systems have defined the mechanisms underpinning these observations, but in other situations the mechanisms of this cellular cross talk remain to be elucidated (3). Glomerular cells respond to injury depending on the nature, magnitude, and duration of the insult. An overview of typical responses of intrinsic cells to injury is presented in Table 1. This article will set the scene for later articles in this series (Glomerular Diseases: Update for the Clinician) by describing the key cellular players in glomerular disease, using selected illustrative examples. Figure 2 summarizes some of the ways in which glomerular injury can occur, with individual diseases that will be discussed below and in later articles in this series. Simplified diagrammatic representation of a selection of mechanisms of glomerular injury. (A) Antibody-mediated glomerular injury. From left to right, (i) neutrophils (shown) and macrophages induce injury after anti-α3(IV)NC1 autoantibodies bind to the GBM in anti-GBM GN; (ii) in membranous glomerulopathy autoantibodies against PLA2R1 (and other antigens) on podocytes are deposited subepithelially, with the involvement of complement; (iii) antibodies can bind to antigens lodged in the glomerulus (grey dots) with recruitment of macrophages (shown) and neutrophils, and the activation of complement; (iv) circulating immune complexes can be deposited in glomeruli, activate complement, and recruit leukocytes; (v) ANCA, (with complement) activates neutrophils and enables their recruitment to the glomerulus. Not shown, but important, is IgA deposition in mesangial areas. (B) Cell-mediated immune mechanisms. (i) Effector CD4+ cells (often Th1 or Th17 type) recognize antigens that can be intrinsic to or planted in the glomeruli. This occurs via their T cell receptor recognizing MHC class II peptide complexes (several cell types could possibly be involved in this process). Activated T cells produce cytokines (IL-17A and IFN-γ as examples) that have direct effects on intrinsic kidney cells and activate, together with costimulatory molecules (e.g., CD154/CD40), innate leukocytes such as macrophages. Not shown are interactions between intrinsic renal cells and T cells that include costimulation and cytokines. (ii) CD8+ cells can recognize antigenic peptides with MHC class I on intrinsic cells and secrete cytokines or induce cell death. (C) Metabolic, vascular, and other mechanisms of injury. Podocyte and foot process injury and dysfunction occurs due to (i) genetic abnormalities of slit diaphragm proteins and (ii) in minimal change disease and FSGS due to circulating permeability factors. Metabolic factors such as (iii) systemic and intraglomerular hypertension and (iv) hyperglycemia and its consequences are common, and affect both the cells and the structural components of the glomerulus. Both glomerular endothelial cell and podocyte injury are important consequences of preeclampsia, involved a number of mediators including soluble fms-like tyrosine kinase-1. C3 glomerulopathy, as well as some types of atypical hemolytic uremic syndrome (vi), can be induced by autoantibodies to, or genetic abnormalities in, complement regulatory proteins, resulting in complement activation. α3(IV)NC1, the non-collagenous domain of the α3 chain of type IV collagen; FLT1, fms-like tyrosine kinase-1; GBM, glomerular basement membrane; Mac, macrophage; M-type PLA2R1, phospholipase A2 receptor 1; Th, T helper; VEGF, vascular endothelial growth factor. Mesangial cells provide support for the glomerular capillary network and help maintain the homeostasis of the mesangial matrix by secreting soluble factors. When injured, mesangial cells can develop an activated phenotype or die (via apoptosis or other mechanisms) (5). Circulating soluble factors or metabolites can induce these responses directly, or cause mesangial cells to secrete factors that elicit these responses in an autocrine manner (6). In a process analogous to wound healing, mesangial cell injury without ongoing injurious stimuli may result in healthy remodelling of the glomerulus, with mesangial cell migration, proliferation of mesangial cell precursors in the juxta-glomerular apparatus, and production of appropriate mesangial matrix (7). Mesangial cell activation commonly results in hypertrophy and proliferation, excessive matrix production, and the production of reactive oxygen species (5). Activated mesangial cells produce chemokines and cytokines, which act on mesangial cells themselves and on other resident glomerular cells or leukocytes. These nearby cells in turn secrete mediators that act on mesangial cells, forming a paracrine loop (3). PDGFB is a potent mesangial cell mitogen. Its production by glomerular endothelial cells is essential for mesangial cell development (5) and its expression is upregulated in IgA nephropathy and other proliferative forms of GN (8). Mesangial matrix expansion and the release of vasoactive mediators results in decreased glomerular surface area and altered glomerular hemodynamics, with decreased GFR (3,5). If mesangial cell activation is ongoing, ECM accumulation in the interstitial space leads to interstitial fibrosis, followed by glomerulosclerosis (9). Mesangial cells are targets both in immunologic injury and in metabolic disease. Mesangial IgA deposition is the hallmark of IgA nephropathy. In this disease, current models imply a multihit pathogenesis with immune complexes of anti-glycan autoantibodies and galactose-deficient IgA1 being deposited in the mesangium, resulting in mesangial cell injury and proliferation (10). 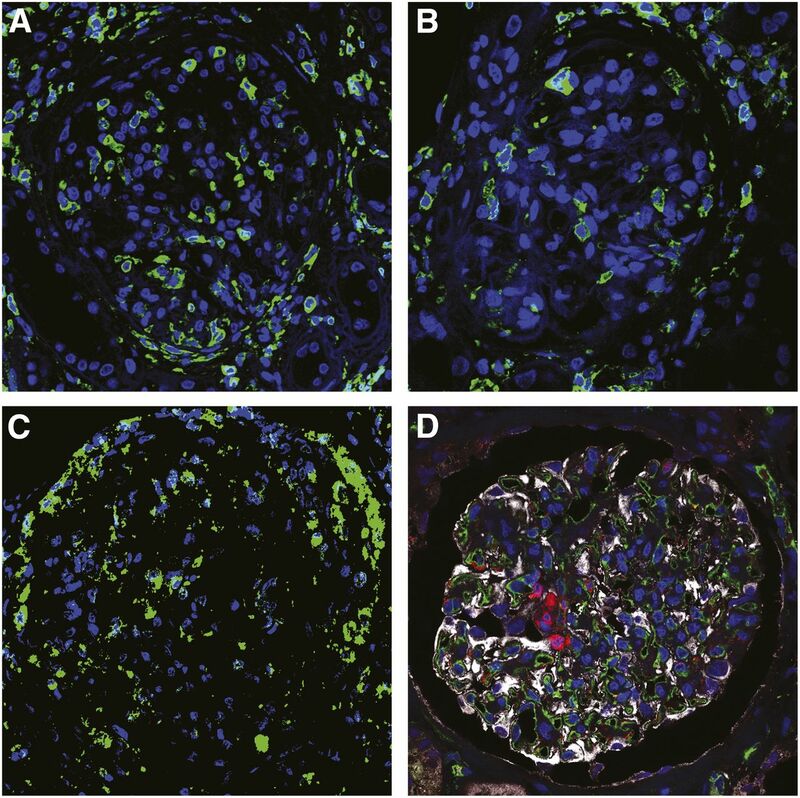 Mesangial cell hypertrophy and matrix expansion are histologic features of diabetic nephropathy, mediated by metabolic and hemodynamic changes in the setting of diabetes. These include hyperglycemia, advanced glycation end products, oxidized free fatty acids, and angiotensin II (5). Acquired or genetic abnormalities of the GBM may also influence the phenotype and activation status of mesangial cells, with mesangial matrix expansion and subsequent glomerular sclerosis, as in experimental Alport disease (11). Glomerular endothelial cells are uniquely adapted for selective permeability and filtration. Although the glomerular endothelium is continuous, it contains fenestrations, which cover up to 50% of the glomerular surface area (12). On conventional electron microscopy these fenestrations appear as ovoid transcellular “holes”, 60–70 nm in diameter (12). However, the fenestrations (and the glomerular endothelium itself) are covered by glycocalyx, a carbohydrate-rich, gel-like mesh with important roles in capillary permeability, regulation of the interactions between leukocytes and endothelial cells, and transduction of shear stress (12). In some disease states, endothelial injury leads to altered microvascular permeability and albuminuria. Inflammatory stimuli increase permeability by widening endothelial cell-cell junctions, and in some instances, inducing transcellular holes (13). Endothelial disease is a feature of rapidly progressive forms of GN, including ANCA-associated GN, anti-GBM GN, and class 3 and 4 lupus nephritis. However, reduced GFR also occurs in association with a loss of endothelial fenestral area in other diseases, such as preeclampsia (14) and diabetic nephropathy (15). Glomerular endothelial cells are particularly vulnerable to injury mediated by complement dysregulation, for example in atypical hemolytic uremic syndrome (16). Podocyte-derived vascular endothelial growth factor (VEGF) is critical to the maintenance of endothelial cell structure and function. Anti-VEGF therapies are associated with proteinuria in humans, and mice with a podocyte-specific VEGF deletion develop proteinuria (17). The glomerular endotheliosis and proteinuria seen in preeclampsia is associated with increased placental production of soluble fms-like tyrosine kinase-1, an endogenous VEGF antagonist (18). The endothelial glycocalyx is predominantly composed of proteoglycans, with their negatively charged glycosaminoglycan (GAG) chains covalently bound to the cell surface, and sialoproteins, with adsorbed components such as albumin (12). The net negative charge of the glycocalyx is thought to play a role in the charge selectivity of the GFB, helping restrict the passage of the negatively charged macromolecule, albumin (12). While some data does not support this ‘charge selectivity’ theory (19), it is likely that the glycocalyx, functioning as a hydrogel, forms a physical barrier that is important for permselectivity (12,20). The development of albuminuria in experimental models of diabetes is associated with changes in the glycocalyx, including loss of GAGs (12), which may occur due to hyperglycemia-induced disruption of GAG synthesis (21). Damage to any of the three layers of the GFB (endothelium, GBM, or podocyte) can result in the presence of high molecular weight proteins in the urine (22). However, because changes in component of the GFB often affect the other elements, the contribution of each individual component to the filtration barrier is not easy to discern (22). Additionally, even in health, a significant amount of albumin may pass through the GFB and be retrieved by the proximal tubule, mediated by the neonatal Fc receptor, FcRn (19,23). The relative importance of these two pathways in glomerular diseases remains the subject of debate and may differ in individual diseases and patients (23). Glomerular endothelial cell injury may promote tubulointerstitial fibrosis, leading to ESRD in CKD (24). Shear stress is necessary for glomerular endothelial function and with poor glomerular perfusion, decreased survival signals from endothelial cells induce regression and rarefaction of the peritubular capillary network (24). This reduced microvascular blood flow results in chronic tubulointerstitial hypoxia and fibrosis, with inflammation from damaged tubular epithelial cells propagating further endothelial cell injury (24). Podocytes possess multiple foot processes that wrap around the glomerular capillaries, with filtration slits between adjacent processes (25). Although sometimes described as a specialized epithelial cell, the podocyte is a uniquely differentiated cell with some mesenchymal features (4,26). Diseased podocytes may exhibit actin cytoskeletal rearrangement, loss of the slit diaphragm, a more cuboidal morphology (27), and may dedifferentiate in disease along epithelial or mesenchymal pathways, termed ‘podocyte disease transformation’ (26). Podocytes have limited capacity for repair or regeneration, with podocyte loss being a feature of many conditions that lead to glomerulosclerosis (28). As podocytes are lost from glomeruli, the GFB is compromised; experimentally, when >20% of podocytes are lost, progressive glomerulosclerosis ensues (29). Evidence that the extent of podocyte loss determines outcome is consistent with the “podocyte depletion” hypothesis (30). This hypothesis unifies a variety of glomerular diseases by postulating that the degree of podocyte depletion induced by injurious processes is a critical determinant of progression to glomerulosclerosis. The term ‘podocytopathy’ describes disease that feature podocyte dysfunction as the primary manifestation of the disease process and that result in significant proteinuria. Podocytopathies commonly occur due to circulating factors or inherited deficiencies of podocyte genes (4,31), and include minimal change disease and FSGS. However, podocyte injury and loss can also occur due to other environmental cues, including indirectly, due to abnormalities in the paracrine, ECM, and GBM-mediated signaling necessary for normal podocyte function (4,25). Both intact junctions between podocyte foot processes at the slit diaphragm and adhesion of podocytes to the GBM are essential for the function of the GFB (25). Podocyte detachment occurs due to increased shear stress either in glomerular hypertension or hyperfiltration, or to impaired podocyte adhesion, more commonly occurring in inflammatory glomerular diseases (28). Podocyte adhesion to the GBM involves a range of regulatory and scaffold proteins. As well as serving as a mechanical anchor, adhesion is an interface for the bidirectional transmission of signals concerning cell growth, differentiation, and survival (32). Podocyte transmembrane receptors bind to the GBM, with the extracellular domain binding to a specific GBM protein (e.g., collagen or laminin), and the intracellular domain recruiting effector proteins linked to components of the podocyte cytoskeleton, most commonly actin. Integrins are a major family of such transmembrane receptors, with mutations in integrins and changes in activation status implicated in a number of diseases, including FSGS (33,34). Podocyte foot processes are connected by the podocyte intercellular junction, commonly called the slit diaphragm due to its appearance on electron microscopy. This junction is a necessary component of the GFB that determines glomerular permeability characteristics. Within the kidney, nephrin and podocin are unique to the podocyte and essential for its function (25). Inactivating mutations of the genes encoding nephrin and podocin causes nephrotic syndrome with diffuse collapse of podocyte foot processes (35,36). Both proteins are also involved in signal transduction (37), and signaling via adaptor proteins has a major influence on the function of the podocyte actin cytoskeleton (25). Lastly, podocytes may act as “immune cells” (38) that under some circumstances, present antigenic peptides to CD4+ T cells (39). PECs adhere in a monolayer to Bowman’s capsule, and in humans are morphologically similar to squamous epithelial cells (1). Several subpopulations of PECs exist in humans, expressing combinations of podocyte, progenitor, or tubular markers, although no consensus has been reached on the nomenclature and function of these cell types (1). Although podocytes and PECs are derived from a common mesenchymal progenitor, PECs proliferate under normal conditions, whereas terminally differentiated podocytes have limited ability to regenerate (1). Some studies suggest that some PECs can differentiate into podocytes (1,40), supported by in vivo imaging studies in mice showing not only migration of PECs to the visceral layer of the glomerular tuft, but also nanotube “bridges” between podocytes and PECs, and podocyte migration to the Bowman’s capsule epithelial layer (41). While PECs may be able to play a reparative role, they can also contribute to injury after conversion. Activated PECs can proliferate and contribute to crescent formation in rapidly progressive GN (1), or participate in the formation of pseudocrescents and sclerotic lesions, as in certain forms of FSGS, with PECs migrating to the glomerular tuft and producing ECM matrix proteins (1). Leukocytes participate in many forms of glomerular disease. They can influence disease by inducing, dampening, or resolving systemic immune responses that lead to glomerular disease. Alternately, leukocytes may act locally within the glomerulus to mediate inflammation, or potentially to resolve inflammation and mediate repair, or contribute to homeostasis within normal glomeruli. Figure 3 shows leukocytes within glomeruli in GN. The systemic actions of a range of innate and adaptive leukocytes are critical to glomerular diseases discussed in articles later in this series. The pathogenesis of these diseases are intimately related to leukocyte behavior and activity systemically, for example, the loss of tolerance and the generation of nephritogenic autoimmunity in secondary lymphoid organs (42–46). Leukocytes in glomeruli of patients with rapidly progressive GN. High powered photomicrographs as illustrative examples of leukocytes within glomeruli in ANCA-associated GN. In all panels cell nuclei are stained with 4′,6-diamidino-2-phenylindole (blue). (A) CD45+ cells (green, CD45 is a common leukocyte marker) in the glomerulus, (B) CD3+ T cells (green), (C) CD68+ macrophages (green), and (D) myeloperoxidase (red) expressing leukocytes (neutrophils or macrophages) in a segmental glomerular lesion with local loss of CD34 (green), an endothelial cell lesion. Nephrin (marking podocytes) is in white. Magnification: (A), (C ) and (D) x400; (B) x600. Photomicrographs from Ms. Kim O’Sullivan. Cross-sections of glomeruli from humans without renal disease show few leukocytes, suggesting that the glomerulus may not, under steady state conditions, support substantial leukocyte recruitment. However, viewing normal mouse glomeruli in vivo in three dimensions over time shows that leukocytes patrol the normal glomerulus (Figure 4A) (47). Patrolling monocytes in glomeruli are phenotypically similar to monocytes that survey other blood vessels, and although they may have homeostatic functions, they could also promote renal and glomerular inflammation by sensing danger (48). Leukocyte recruitment and behavior in the glomerulus. (A) In health, neutrophils and monocytes (and potentially other leukocytes) patrol the glomerulus. While some are static, the majority migrate bidirectionally within glomerular capillaries. (B) In acute disease, leukocytes can be recruited and retained in glomeruli via a number of molecular processes. Examples are given with reference to the neutrophil (from left to right). Neutrophils can be recruited via direct FcγR-Fc interactions. Adhesion molecules participate in recruitment, migration, and retention, with, for example, Mac-1 (CD11b/CD18) on neutrophils slowing migration and inducing retention. P-selectins is not constitutively expressed by glomerular endothelial cells, but in some situations P-selectin can participate in forming bridges with recruited platelets (pink oval) to recruit neutrophils. Lastly, chemokines, for example CXCL8 (IL-8) secreted by endothelial cells, podocytes, mesangial cells (not shown), or other leukocytes (not shown), attract leukocytes expressing appropriate chemokine receptors down a concentration gradient. Other mechanisms, for example complement (not shown), can also attract leukocytes to the glomerulus. FcγR, Fcγ receptor; ICAM-1, intercellular adhesion molecule 1. A variety of leukocytes are recruited to glomeruli in inflammatory glomerular disease. 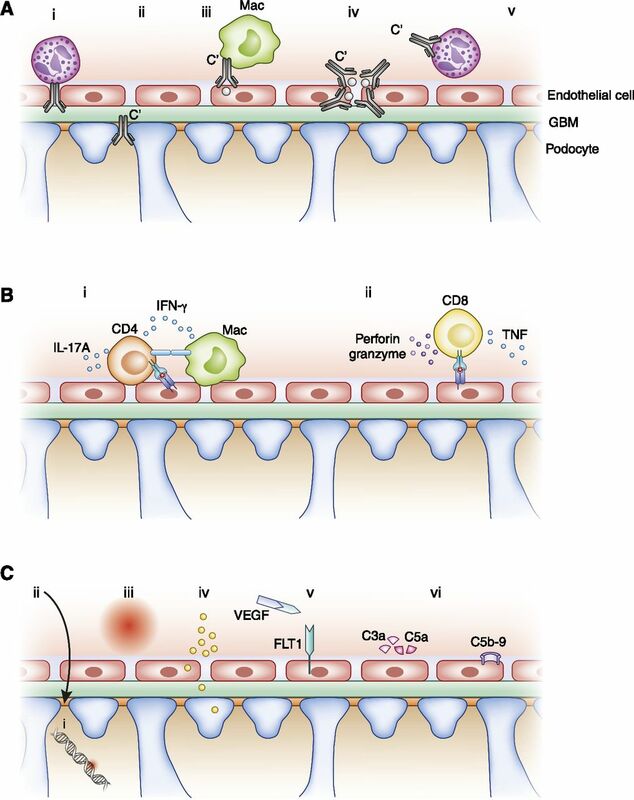 Generally speaking, leukocyte recruitment is mediated by adhesion molecules and chemokines (Figure 4B). Adhesion of leukocytes in glomerular capillaries does not follow the traditional selectin-mediated rolling paradigm that exists in postcapillary venules in other tissues. On recruitment, leukocytes halt suddenly in glomerular capillaries (49), with some remaining static and others migrating bidirectionally (47). The specific adhesion molecules that mediate this arrest and migration are context-dependent, both in terms of the leukocyte type involved and the process inducing the recruitment. Also critical to leukocyte recruitment are chemokines, with some specialization in that specific chemokines are associated with specific chemokine receptor-expressing leukocytes (e.g., CXCL8/IL-8 and CXCR2-expressing neutrophils). 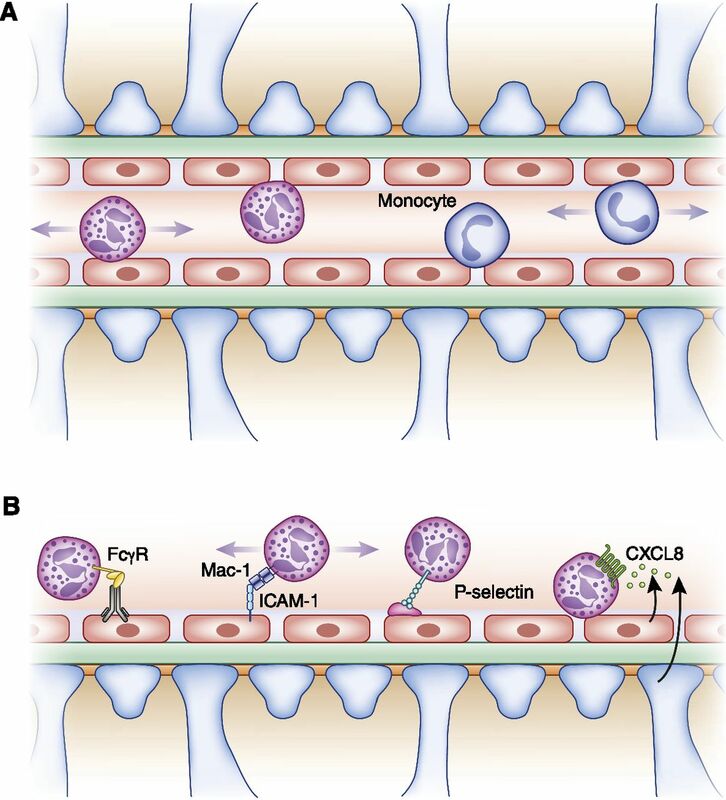 Activated products of complement, C3a and C5a, are chemoattractants, while other mediators are more specialized, e.g., leukocytes that express Fcγ receptors, monocyte/macrophages, and neutrophils, are recruited via IgG deposited in glomeruli (50). Neutrophils, the most abundant immune cells, are first-line responders in inflammation and in a variety of glomerular diseases. On activation, neutrophils produce and release reactive oxygen species, proteases, cytokines, and chemokines. Neutrophils are activated systemically (51,52), or locally by proinflammatory mediators generated or deposited in the kidney, such as immune complexes (47). Proinflammatory products of neutrophils directly damage the GFB. In addition, in some forms of GN (such as ANCA-associated GN and lupus nephritis) neutrophils generate neutrophil extracellular traps, web-like structures of histones decorated with proteases, peptides, and enzymes that are also likely to be injurious (53). In vivo microscopy reveals that a neutrophil can influence injury over a considerable proportion of the glomerulus by crawling within glomerular capillaries, in one disease model covering an average of 150 μm/hour (47). Innate cells of the monocyte/macrophage lineage have multiple roles in tissues. Macrophages can adopt proinflammatory (M1) or anti-inflammatory (M2) phenotypes, although these phenotypes exist on a continuum (46). These phenotypes are plastic in vivo, with macrophages responding to cues in the tissue microenvironment. In the initial phases of experimental AKI, due to ischemia reperfusion injury, macrophages in the interstitium are proinflammatory and damaging (54). After the injurious stimulus subsides, the same cells take on a healing and reparative role (54). There is no intrinsic reason why intraglomerular leukocytes, in some situations, are not also anti-inflammatory. While these reparative roles are healthy if injury is self-limited, when pathologic processes are ongoing, macrophages function as “frustrated” healing cells and contribute to progressive fibrotic injury. In autoimmune kidney disease, both humoral and cell-mediated effector responses use macrophages as effector cells. Glomerular IgG activates macrophages via Fc-FcγR interactions, while effector T helper 1 (Th1) and T helper 17 (Th17) cells activate these cells both by cytokines and via cell-cell contact. Dendritic Cells: The Interstitium, and the Glomerulus As Well? Systemically, dendritic cells (DCs), specialized leukocytes that present antigen to T cells, play a key role in adaptive immune responses that cause GN. In the kidney, DCs form an extensive interstitial network (55), where they help maintain tolerance to filtered self-peptides (56) and act innately as pro- or anti-inflammatory renal mononuclear phagocytes. These interstitial DCs are largely acutely protective. However, in inflammatory states, recruited inflammatory monocytes differentiate into proinflammatory DCs, while activated resident DCs carry antigen to draining lymph nodes and activate naïve T cells. In contrast to the interstitial DC network, DCs are rarely present in normal glomeruli (57) and only uncommonly in acute disease. While human biopsy studies are divided as to the presence of DCs in glomeruli in more established injury, in established rapidly progressive GN, DCs within injured glomeruli may participate in T cell recruitment and activation (43). While mast cells traditionally are considered as mediators of anaphylaxis and allergy, they are tunable cells that contribute to, and regulate inflammation and autoimmunity. In addition to histamine and other mediators of allergy, mast cells secrete both stored and newly synthesized pro- and anti-inflammatory cytokines. Mast cells are present within the kidney in GN in both the tubulointerstitium and the glomerulus. Intrarenal mast cells are proinflammatory, with the capacity to degranulate (58), while in secondary lymphoid organs they are anti-inflammatory, acting with regulatory T cells to help maintain tolerance (59,60). Conventional CD4+ and CD8+ T lymphocytes have a wide range of αβ T cell receptors that can recognize a huge variety of antigenic peptides. T cells are instrumental in protection from infectious threats but in disease, T cells mediate a number of forms of inflammatory and autoimmune glomerular disease. CD4+ cells orchestrate adaptive immunity, differentiating into subsets that direct the subsequent components of the immune response. These subsets, while somewhat plastic, are definable by their signature cytokines, transcription factors, and to some degree, chemokine receptors (44). In glomerular disease, T follicular helper cells promote T cell–dependent antibody production. In contrast, Th1 and Th17 cells recognize antigens intrinsic to, or planted in glomeruli, and act as local effectors of glomerular injury in experimental rapidly progressive forms of GN (61). Th1 cells are particularly associated with macrophage activation, and Th17 cells are associated with neutrophil recruitment and activation. Temporally, at least in responding to foreign antigens, Th17 cells act earlier in immune responses and over time convert to a mixed Th1/Th17 or Th1 phenotype (44). Th2 cells support eosinophils, important in allergic interstitial nephritis and in glomerular disease in sub-Saharan Africa (62). CD8+ cells are cytotoxic, killing cells that express their cognate peptide with MHC class 1, but also secrete cytokines and may act in a proinflammatory manner (63). B cells and their terminally differentiated progeny, antibody-secreting plasma cells, are critical cells in humoral immunity. Within lymphoid organs, they produce antibodies that impact the glomerulus in different ways in many forms of GN. In autoimmunity and after some infections, Igs can form circulating immune complexes that are deposited in glomeruli, including IgA1 complexes in IgA nephropathy. Alternately, in situ immune complexes form when antibodies bind to antigens that are intrinsic to the glomerulus or antigens that have been “planted” in the glomerulus. In malignant conditions, such as multiple myeloma, single clones of antibodies or light chains can be deposited in glomeruli, while cryoglobulins (both IgM and IgG) lodge in glomeruli in infectious, autoimmune, and malignant diseases. Antibody production by the B cell/plasma cell lineage is not the only possible role for B cells. In GN, B cell aggregates in the interstitium could secrete cytokines and, especially in established autoimmune responses, autoreactive B cells may assist in antigen recognition by concentrating autoantigenic peptides derived from autoantigens internalized by their own cognate B cell receptor (64). A variety of immune cells, including some CD4+ and CD8+ T cells, macrophages, and DCs, dampen both systemic immunity and local inflammation. The best described subset is the CD4+CD25+foxp3+ regulatory T cell (Treg) that maintains tolerance and dampens inflammation via soluble mediators and cell-cell contact. Both endogenous and exogenous Tregs regulate experimental glomerular disease (65,66) by inhibiting systemic immunity, and probably also via local effects. Studies using regulatory CD8+ T cells in experimental membranous nephropathy illustrate their anti-inflammatory role (67), with transfer of regulatory macrophages and DCs also limiting experimental glomerular disease (68,69), including progressive and chronic fibrotic injury. Given the potential plasticity of many of these cells, future cell therapy trials would need to consider the question of the stability of transferred immune cells. Other potentially important leukocytes include natural killer (NK) cells, other innate lymphoid cells, and unconventional T cells: γδ T cells, NK T cells, MR1-restricted mucosal associated invariant T cells, and MHC class 1b–reactive T cells (70). Some unconventional T cells interact with MHC class I/II-peptide complexes, but in a manner distinct to that of classical T cells, while others recognize glycolipids, vitamin B metabolites, and modified peptides. Unlike conventional αβ cells, whose T cell receptors undergo somatic recombination, unconventional T cells have relatively restricted patterns of antigen recognition (70). Little is known about these cells in glomerular disease. However, for example, NK cells and their ligands are present in the kidney in human lupus nephritis (71). Experimentally, deficiency of invariant natural killer T cells exacerbated GN (72,73), while proinflammatory γδ T cells are present in kidneys after passive antibody transfer (74). Some of these subsets are particularly relevant to mucosal immunity, with clear potential relevance not only for IgA nephropathy but also for other forms of glomerular disease. Interactions between leukocytes and resident glomerular cells in immune glomerular disease are dynamic and substantial, going beyond the simplistic paradigm of glomerular cells merely being the target of leukocyte-mediated injury. Cytokines, chemokines, and costimulatory molecules from intrinsic glomerular cells activate (and regulate) leukocytes locally, and it is possible that effector T cells recognize antigenic peptides displayed by intrinsic glomerular cells. There are many examples of these interactions: chemokines derived from toll-like receptor 4–expressing glomerular endothelial cells recruit neutrophils in experimental ANCA-associated GN (75), while cytokines and costimulatory molecules expressed by intrinsic renal cells participate in local activation of effector CD4+ T cells in experimental GN (76,77). The glomerulus is vulnerable to injury from inflammatory, metabolic, and other disease processes, which not uncommonly involve the “dark side” of innate and adaptive immunity. In recent years we have made great progress in understanding glomerular disease. We now better understand systemic disease processes that direct glomerular injury; the local cellular, humoral, metabolic, genetic, and molecular responses that induce injury; the detail of the pathologic appearances of human glomerular disease; and some of the prognostic indicators. This knowledge allows us to take a more integrated view of glomerular disease. Key challenges in the future include not only identifying common local pathways for intervention and regulating systemic processes that mediate glomerular disease, but also developing more specific and less toxic therapies specific to individual glomerular diseases, and subsets of patients (or even individual patients) with a specific disease. A.R.K. has been a member of an advisory board for Roche Products, Australia. No Roche studies (that the authors are aware of) are reported or discussed in the manuscript. H.L.H. declares no conflicts of interest. Ms. Kim O’Sullivan is thanked for the photomicrographs in Figure 3. We apologize to the many excellent researchers whose work we have not discussed and cited. Research performed by A.R.K in glomerular disease is funded by Project Grants from the National Health and Medical Research Council of Australia (NHMRC) (nos. 1048575, 1045065, 1046585, 1064112, and 1084869). H.L.H. is funded by an NHMRC Postgraduate Scholarship (no. 1075304).